Our customers are the single most important part of our business. Pajamas and sleepwear are our obsession and we want your purchase to be perfect. Since 2002, we've dedicated ourselves to providing our customers with quality, fun sleepwear at a reasonable price. We are a small, family-owned and operated company and pride ourselves in providing friendly, personal customer service. We have served over 360,000 customers to date and strive to make make our customers' shopping experience easy and fun. We are committed to providing you with a quality product at a reasonable price. How do we do this? We "pound the pavement" at trade shows and throughout garment districts across the country. We have built relationships with both large and small sleepwear manufacturers to bring our customers one of the widest selections of sleepwear products available. We strive to sell only products that we would want our own family to wear. We are committed to providing you with a good value and that means a quality product. How do we achieve this? We test products before buying. We wash and dry them just like our customers would. We want to make sure that they will meet or exceed the standards that our customers expect. If you ever purchase anything from us that you are not happy with, just call or email us and we will correct the problem to your satisfaction. We understand the importance of having the perfect pair of pajamas or slippers to relax in at the end of a long day. We know that a pair of pajamas can make bedtime fun for kids and understand the joy that a pair of superhero pajamas or a princess nightgown can bring to your child. I hope that you will think of us whenever your family needs sleepwear. We are constantly adding to our selection of fun sleepwear, so be sure to check back soon. 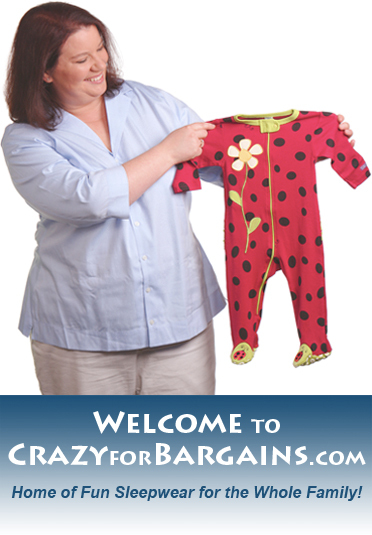 If you have any questions regarding our store or our products, please do not hesitate to contact us at 877-576-5256 (8 a.m. to 4 p.m. MST) or info@crazyforbargains.com. Again, thank you for your business.